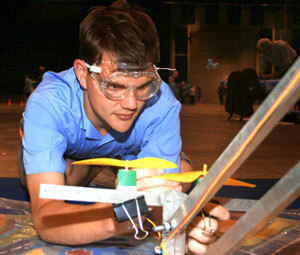 High School students from across the Territory have gone head-to-head in the 2009 Engineers Australia NT Science and Engineering Challenge hosted by Charles Darwin University (CDU). Director of Engineers Australia Northern Division, Bronwyn Russell said the Challenge continued to provide the knowledge and skills that enabled students to design, build, and evaluate integrated technical problems. “The event aims to encourage young Territorians to see the fun side of science and technology with the aim of promoting more people to study engineering, maths and science,” she said. Ms Russell said that following the announcement of the planned development of the Medical School based at CDU, the prospects for young people in the Northern Territory had never been brighter. CDU’s School of Education and School of Engineering and Information Technology have begun to prepare Territory students for entry into the new medical school with scholarships aimed at building talent in Territory schools today. Daniel Strickland, from Sanderson Middle School, said he had always fostered a keen interest in science. “The Science and Engineering Challenge has been a great experience. I’m only in year 9 so I’ll definitely come again next year,” he said. Held in Alice Springs last week and Darwin this week, the Challenge has been giving students the hands-on experience in applying maths and science concepts to solving real-life problems in the Territory. Darwin High School took top honors in winning the Territory-wide competition and will have the opportunity to represent the NT at the national challenge to be held in Bendigo later this year. The school is now looking for sponsorship so the team can compete. The Science and Engineering Challenge aims to create dynamic partnerships with territory schools to produce an increasing and more diverse group of students who will be successful in science, mathematics and information technology here in the NT. This is the third year the challenge has been held in the NT due to partnerships with Engineering Australia NT, CDU, Rotary Club of Darwin North, the Department of Education and Training, and local high schools.